FIRST TIME COMPETITORS – Level 1 Team receiving first place award. Anxious, excited and determined, 30 gymnasts travelled to the nation’s capital for the Atlantis Crown Invitational on December 16. The competition consisted of Men’s and Women’s Artistic Gymnastics and for the first time ever, Rhythmic Gymnastics. 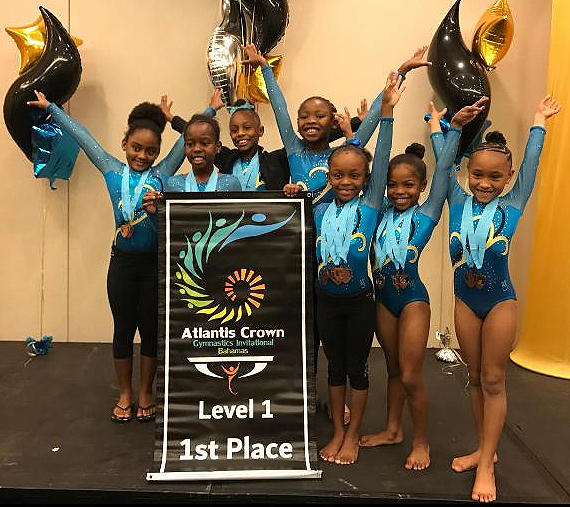 The crown has earned the title of the largest gymnastics competition in the Caribbean hosting over 1,000 gymnasts from 81 clubs representing countries from around the globe. Countries represented were The Bahamas, Surinam, Great Britain, Colombia, Canada and USA.